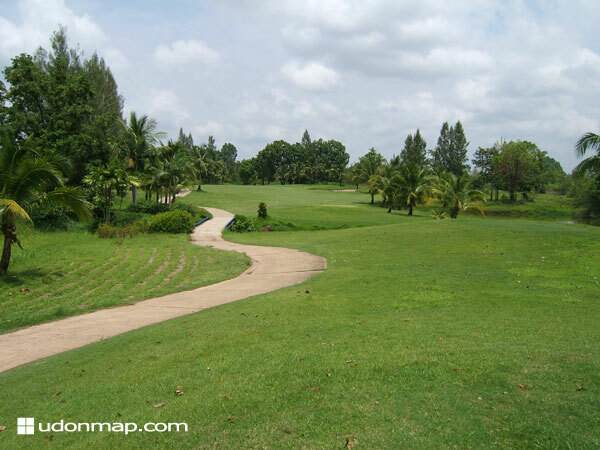 There are plenty of places to run or walk around Udon Thani, the most popular being Nong Prjak Park Map ref P6. There is also an Olympic style running ground at the Physical Education College Map ref C12.Nong Bua Lake Map ref R13 is also another area used for running and walking and is much quieter that the other parks. Most locals exercise a few hours before sunset when it's cooler and more comfortable. Most major hotels such as Napali (Map E11), Charoen (Map O13) and Charoensri Grand (Map O11) have decent size swimming pools but make sure you get there early to beat the crowds. Most of these pools have daily, monthly and annual rates. Bar Berry club and restaurant has a good decent size pool, Thomas resort (Map Y18) is home to a smaller attractive pool and the Bamboo garden (Province Map G8) has a nice and quite pool amongst beautiful gardens. There is also a nice pool at Sonmangorn restaurant on the eastern ring road (Map V10). 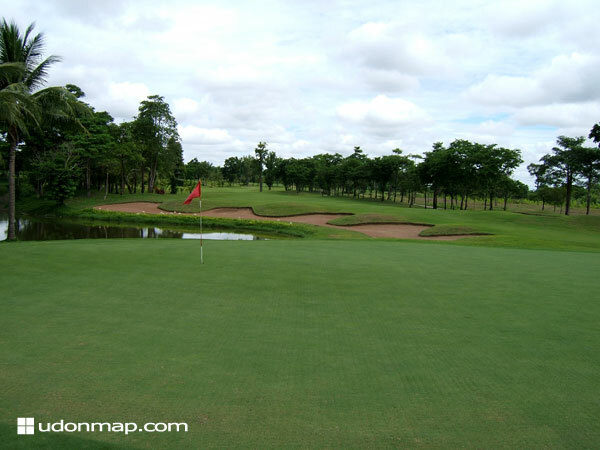 Golfers are well catered for in Udon Thani, there are 4 9-hole courses and one nearer Nong Khai which is an 18 hole course. Prices start at 120bt and a little extra for a caddy tip which you usually pay at the end of your round. 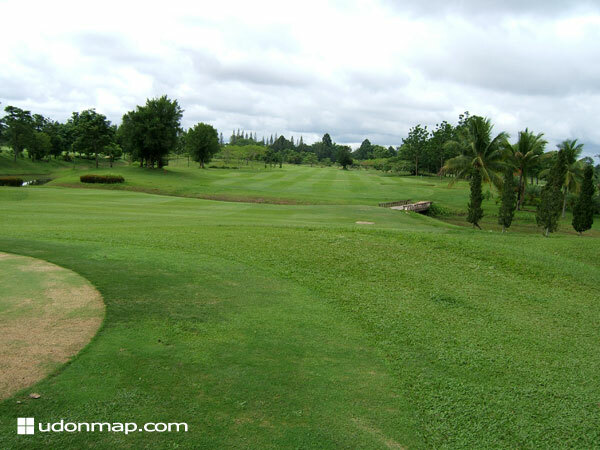 Some courses have their own driving ranges, there is also a driving range in Udon Thani on a small road leading off Phosi road Map V19 next door to Dutch Milk shop. Comments: A beautiful course with first-class facilities, including overnight accommodation. Comments: A popular course amongst the resident farangs. 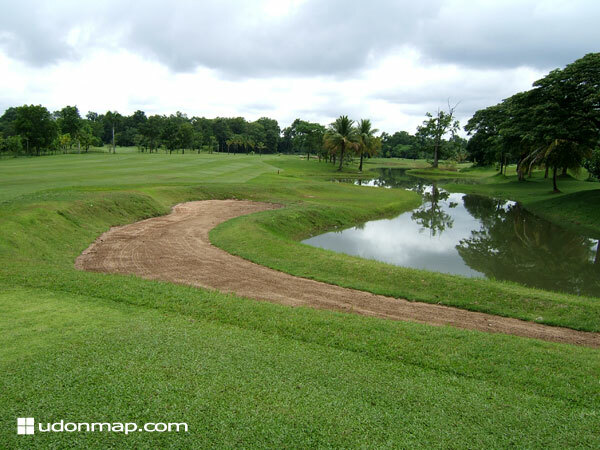 The course is usually in good condition and requires you to use almost every club in your bag. 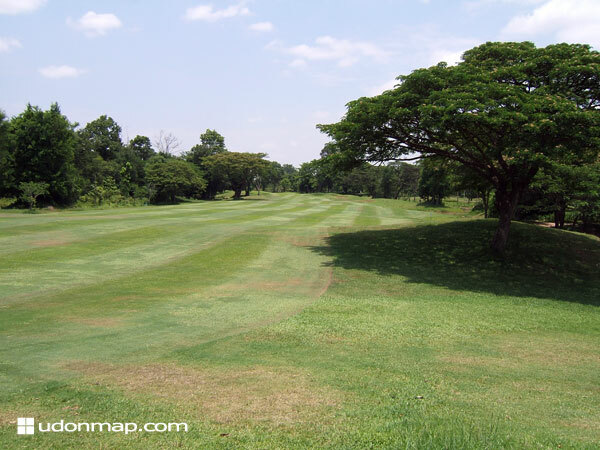 Comments: An attractive little course, greens can be a little patchy but overall pretty good. 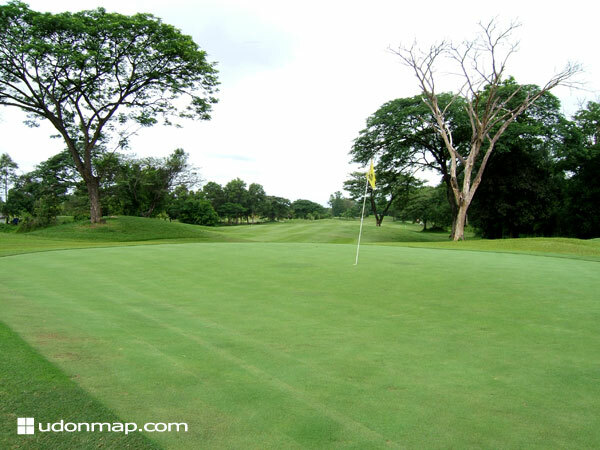 Udon Thani has its own ex-pat golf society which was founded by 16 ex-pats during 2002 and now has over 70 members. Society days are held each Monday, Wednesday and Friday at the golf clubs listed above, visiting golfers are welcome to join in for a round of social golf, and Tee off time is around 8.30am. Society times and dates can be seen on the notice boards of the golf clubs mentioned above. One of the best gyms with modern facilities can be found at the Ban Chaing hotel (Map I11), there you will find a fully equipped gym with aerobics area exercise machines and weights, below is a spa with sauna. The Napali and Charoensri Grand hotels also have gyms. 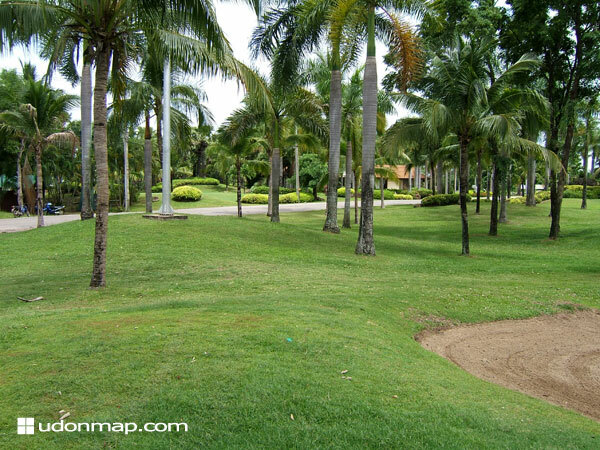 Private gyms can be found at the Englishman's Retreat (Map Ref G1) and BB Resort (Map Ref G1). Tennis courts are available at the Physical Education centre Map C12, Rajaphat Institute Map M14, Soi Phompakhai leading away from the airport Map E16 and and BB Villa (Map Ref G1). Pool tables can be found at Lalita's Bar (Map P11), Mojo Bar (Map O12), Irish Clock (Map Ref P11) and many other bars around Udon Thani.. There is a large snooker hall next to the Udon Hotel (Map K9), next to the western bus terminal (Map C9), accross the road from Mojo's Bar (Map O12) and at Preecha Market (Map P12). Harry's bar (Map C11) has a decent good quality darts board. Udon's main shopping area is Phosi road starting from the fountain round-about (Map M12) and then continues northwest. In this vicinity you'll find a wholesale clothes market, Gold shops, and various local handicraft shops. For general shopping head to Central Plaza (Map O11) or UD Town (Map Q13). Udon has 3 Tesco Lotus stores, Big C, Makro, Tops, Carrefour and Tang Ngeesoon wholesale store. DIY enthusiasts should head to Global house which is a warehouse jammed packed with everything you could possibly need for building, it is across the road from Homemart which is almost the same but maybe has a better range of tiles and bathroom suites but less building accessories. Both places can be found almost facing each other on the north eastern ring-road Map T4. A new clothing hypermarket is currently under construction next door to Index Living Mall on the ring-road and is due to be completed this year. There is a nice waterfall called Thanngam waterfall located in Phoilom Park (Province Map F9). It is most spectacular during the rain season June to Oct.
Huai Luang Dam and resevoir (Province map E8) is a popular place for watersports of all kinds and is only a short drive from Udon Thani. A little further south is Ubonrat dam and lake (Province Map F12) which is also popular for water sports and has a pretty beach in the hot season. Health and fitness is becoming increasingly popular in Thailand today. Aerobics is probably one of the most poplular fitness activities and has really taken off in a big way. You can join the locals at Nong Sim Park and Nong Prajak park for daily aerobics exercise, they usually kick off between 5-6pm. Want to play Bridge In Udon Thani ? There is currently a meeting twice per week, Sunday and Wednesdays - numbers permitting- in Harrys Bar. New players welcome, tuition available. Please contact either David (086-219-6784) or Tom (086-0972-775) for more details.